The EOS M50 is a new entry-level compact system camera from Canon. 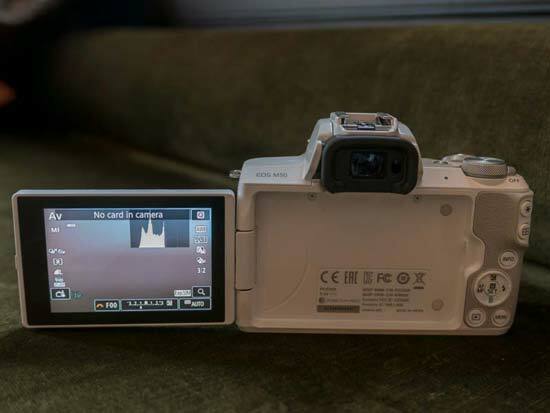 The EOS M50 has a 24.1 megapixel APS-C CMOS sensor, the very latest DIGIC 8 processor, 4K video recording, a touch-screen interface, 99-point AF System, ISO 100-25600, a 3-inch 1,040K-dot LCD vari-angle monitor, integrated Wi-Fi, Bluetooth and NFC connectivity, 10fps burst shooting, CR3 14-bit RAW support, built-in pop-up flash and a flash hot-shoe, and an integrated viewfinder. The Canon EOS M50 is available in white or black in a kit with the EF-M 15-45mm IS STM lens for £649.99 / €779.99 or body only for £539.99 / €629.99 / $759.99. The new EOS M50 is positioned as the third best camera in Canon's mirrorless range, but it closely resembles the flagship M5 model in lots of ways, and in many ways even out-performs it. Just like the M5, the M50 sports a DSLR-like design, albeit one that's been shrunk in the wash. 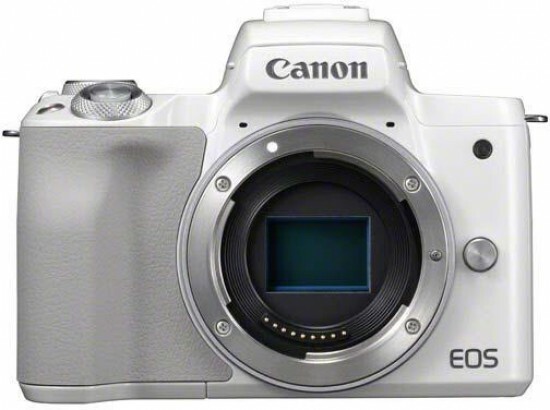 It has a proper integrated electronic viewfinder, only the second EOS M camera to do so, again following in the footsteps of the M50, which is centrally located in-line with the lens mount. Although it's not as high-resolution as the one on the M5, it's perfectly good enough for a mid-range model. From the front, the casual observer would be hard-pressed to tell the two cameras apart. The Canon EOS M50 also has a prominent protruding grip which helps you get good purchase on what is quite a small camera, with your right forefinger resting naturally on the shutter release button. Just like the M5, though, those with particularly large hands may find that the camera is a little on the small side to fit all of your fingers comfortably on the grip. The top of the EOS M50 is the main area where it differs in terms of external design to the M5. 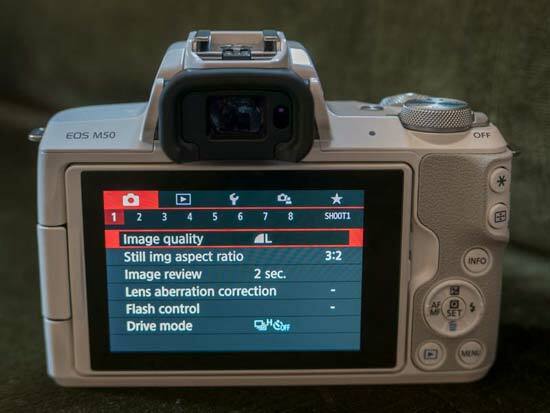 Whereas the flagship model has a multitude of dials and buttons, the M50 is much simpler in terms of its control layout, which may or may not suit you, depending on your experience level and intended use for the camera. The EOS M50 lacks the M5's dedicated exposure compensation dial, and it only has one control dial rather than two, which more experienced shooters will definitely bemoan. On the other hand, it does retain a dedicated shooting mode dial, used to change between the different exposure modes that the camera offers. Here you’ll find all automatic and scene modes, as well as a range of manual and semi-automatic options, such as aperture priority and shutter priority. There’s also a small function button, which can be customised to a wide range of different options in the main menu, including file type, picture style, white balance, manual focus and more. The M50 also usefully adds a one-touch movie record button to the top-plate that's more logically placed alongside the shutter release button. Video is one of the main differences between the M5 and M50, surprisingly in favour of the cheaper camera. Thanks to the Digic 8 processor, the M50 takes the title of first Canon mirrorless camera to offer 4K video recording, which, in conjunction with the vari-angle LCD screen that be rotated to face forwards and the Mic-in port, promises to make the M50 a Vlogger's dream ticket. All is not quite as rosy as a glance at the spec sheet would indicate, though, as the M50 automatically applies a 1.7x crop on the sensor in 4k mode, which effectively changes the focal length of the fitted lens and makes wide-angle shooting virtually impossible. This gets even worse when using the digital stabilisation system during video recording, which extends the fitted lens by 2x, and also the ISO range tops out at ISO 6400, rather than 25600 as when shooting stills. The final nail in the coffin for 4K video is the fact that the excellent Dual Pixel CMOS AF system doesn't work when recording in 4K, only 1080p, with the camera reverting to the much slower and less accurate contrast-based AF. So all in all, 4K video is something of a half-baked disappointment on the EOS M50, something that doesn't do the camera any favours when comparing it to rival models. On a more positive note, the EOS M50 is the first camera to feature Canon's new CR3 14-bit RAW file format, as well as a new C-RAW option that creates full resolution RAW files that are approximately 30 to 40% smaller in size than standard RAW files without any appreciable drop in quality. The camera has both a flash hotshoe for attaching an external flash and an inbuilt flash that's released simply by grabbing the front and flipping it up - no dedicated release button here. Although it's not particularly powerful, it does tick one of the must-have boxes for this level of camera. Flip to the back of the Canon EOS M5o and much of its rear is taken up by the three-inch touch-sensitive screen. The vari-angle screen flips out to the side and then tilts upwards, downwards, and can also face the front. This makes it particular useful for shooting hand-held selfies and vlogs, and is also useful if you want to place the camera on a tripod or other stable surface (such as a table) and take a self-portrait or group shot. 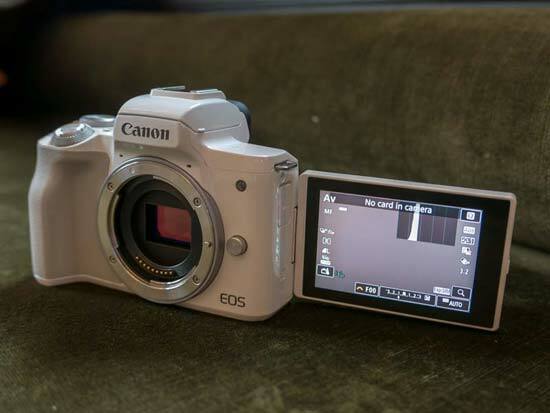 There’s a scrolling dial on the back of the Canon EOS M50 which can be used for certain functions, such as scrolling through images in playback. This doubles up as a four way navigational pad, with each directional key having its own particular function. For example, up controls exposure compensation, left switches on manual focusing, the right is for flash modes, and the bottom key is used for deleting pictures in playback. However, you can customise all of these keys, along with most of the keys, to a different function if you prefer, meaning you can set up the camera exactly how you want to use it. If you're looking for ISO speed, that's set via the touchscreen rather than a dedicated button. A press of the central key in the middle of the scrolling dial takes you to the Quick menu. This can also be accessed via a virtual button on the screen. With this, you can quickly access a variety of settings without having to delve into main menu settings and so on. Around the rear scrolling dial there are three buttons. One is used to switch between different display settings, such as the on-screen level, one is the playback button, and the third is used to access the main menu. The final two buttons are found on the thumbrest, and again can be customised to your own tastes, but have default settings of exposure lock and AF point selection, just like on the flagship M5. Although you can use the AF point selection button to enter the AF selection options, the easiest way to set AF point is to use the touch screen, simply tapping where you want the AF point to be. You can also use the touch screen to do this in conjunction with the viewfinder if you want, by selecting “Touch and drag AF settings” in the main menu. A great feature is that you can use the whole screen to do this, or you can apportion a section of the screen, for example the bottom right to allowing you to change the AF point - this is particularly handy if you find that your nose or face is accidentally moving the AF point when you don’t want it to. The EOS M50 offers pretty respectable continuous shooting speeds considering its price-tag - 10fps with the AF locked at the first frame, or more usefully 7.1fps with continuous AF is nothing to be sniffed at for such an affordable camera. The Canon EOS M50’s electronic viewfinder has an eye-sensor for automatically detecting when it has been lifted to your eye, making it a very fluid movement akin to using a DSLR. It’s not the largest or highest resolution viewfinder, but it is bright and clear and there’s no real noticeable lag when using it for most every day shots. Colours inside the viewfinder appear to be more vibrant and more saturated than colours displayed on the rear screen, and indeed in the final images - so just be aware that the image you see in the viewfinder may not be a 100% accurate representation of the image you’re going to end up with. 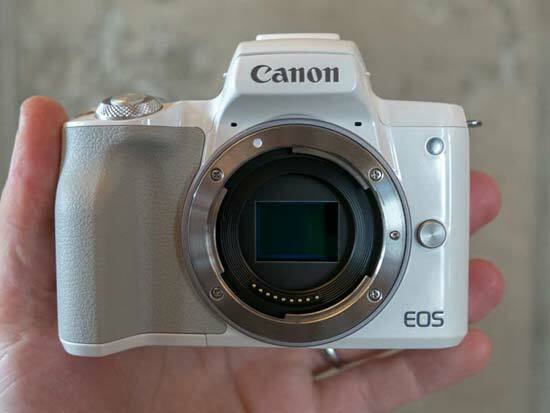 The Canon EOS M5 has both Wi-Fi and Bluetooth connectivity. You can use the latter as a low-power alternative to Wi-Fi to control the camera and for automatically transferring images across to your phone ready for super quick sharing. It’s also easier and quicker to set up and use than connecting to the camera’s Wi-Fi network, which is still a rather long-winded process. 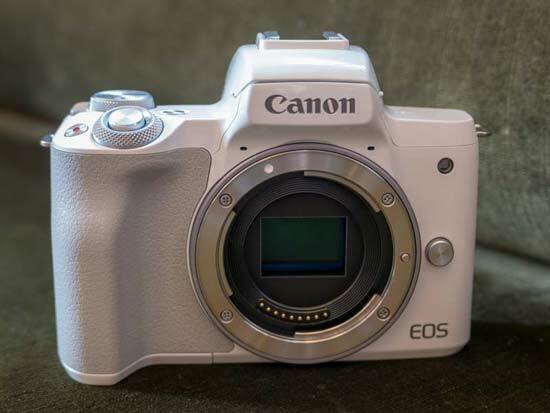 In terms of focusing , the Canon EOS M50 actually has a more sophisticated system than the range-topping M5, expanding the number of AF points 99 (actually 143 areas with certain lenses) and covering 88% of the sensor area. It's also more sensitive in low light, down to -2Ev, and even offers Eye AF, a feature that Sony shooters have been raving about for some time, although the M50 can only do so in One Shot AF mode and not continuous Servo mode. Still, remember that this is a mid-range, not a high-end mirrorless camera like the Sony A7-series. Finally, the EOS M50 uses a smaller battery than the M5, offering 235 shots or 370 in the special ECO mode, down from 295/420. Neithrer camera's battery life is particularly good, so make sure to budget for a couple of spares if you intend to shoot for more than a couple of hours before recharging.